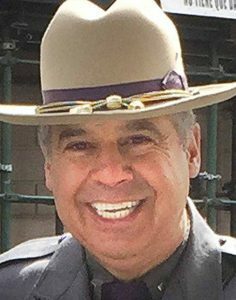 ONEONTA – Retired state trooper Bob Fernandez of Otego is announcing his candidacy for Otsego County sheriff at 1 p.m. Saturday, April 28, at the Oneonta Veterans Club on Chestnut Street. “The people of Otsego County deserve a professional law enforcement leader with experience and integrity,” he said in announcing the date. 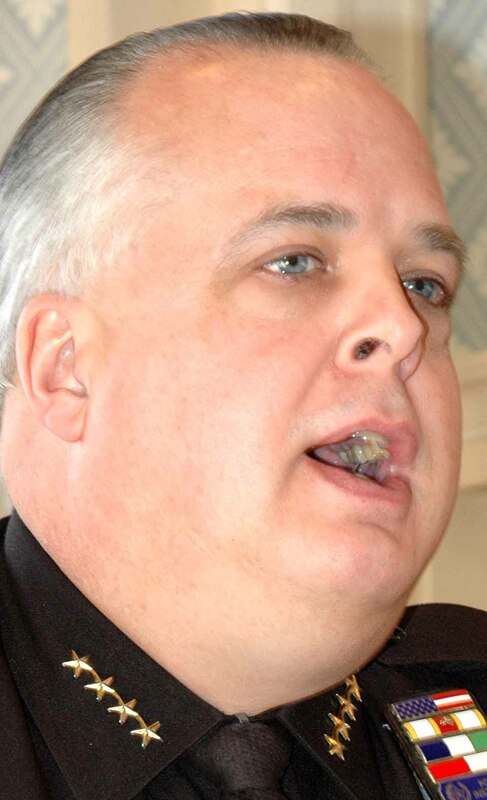 Fernandez is challenging incumbent Sheriff Richard J. Devlin Jr.
MILFORD – The Otsego County Republican Committee endorsed county Sheriff Richard J. Devlin Jr. Saturday for a fourth term, according to county Chairman Vice Casale. 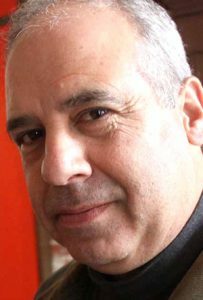 Casale said retired state trooper Bob Fernandez said he will circulate petitions to primary Devlin in a Sept. 10 primary. 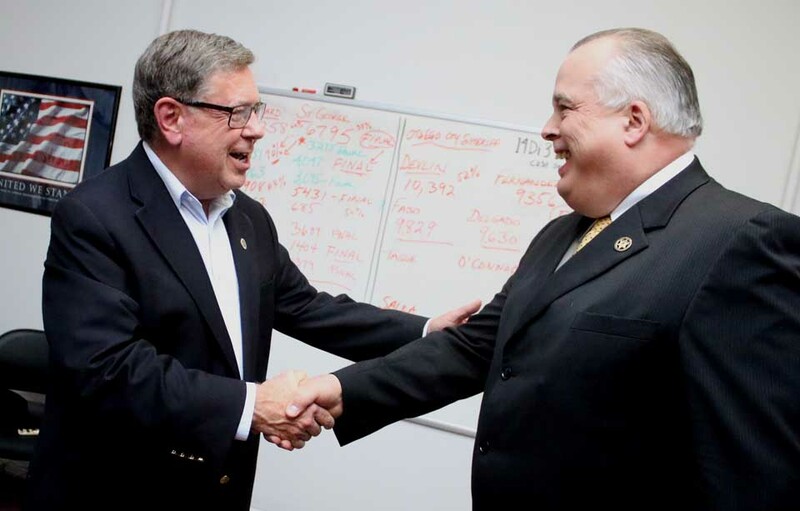 The GOP chair said the secret ballot garnered 2-1 support for Devlin. Fernandez said the actual count was 42-27. 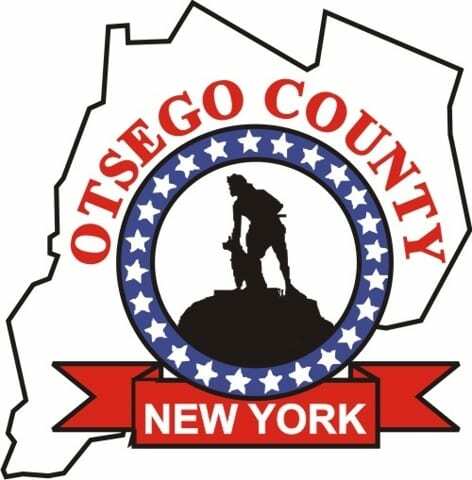 LAURENS – Otsego County Sheriffs have detained a suspect in a double homicide in the Town of Laurens last night. Sheriff Richard Devlin Jr. said that a relative of the deceased called 911 at 8:49 p.m. to report that they had found two adult family members dead inside their residence. 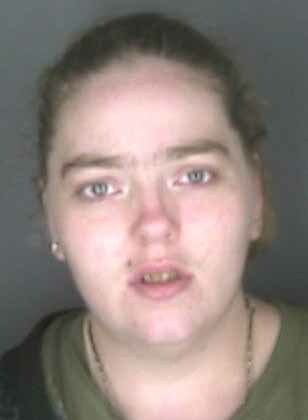 Devlin declined to specify the age, gender or relationship of the deceased. WORCESTER – Two people were arrested with heroin, needles, crack pipes and crack cocaine after failing to return a car they had borrowed from a neighbor, according to the Otsego County Sheriff’s Department. Andrew J. Robinson, 20, Worcester and Victoria C. Keever, 21, Schenevus, were arrested after deputies allege that a Worcester neighbor allowed the defendants to use their vehicle to make what they believed to be a short trip to the store on Sunday, March 12, for approximately one hour. 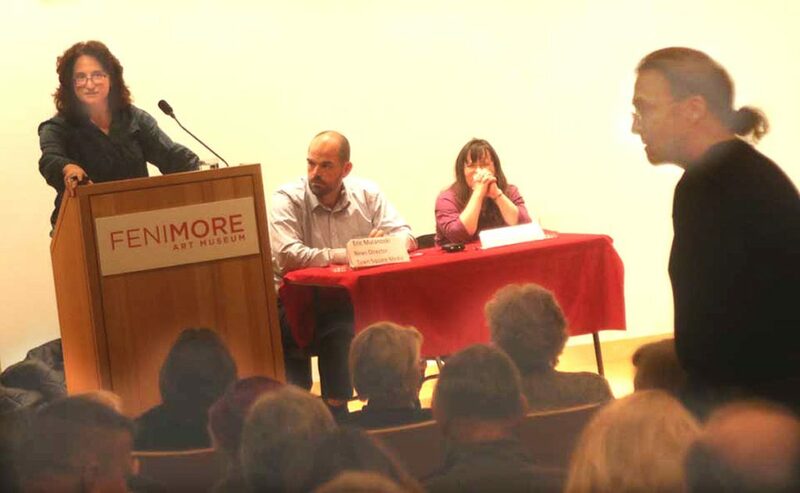 The defendants allegedly failed to return the vehicle as agreed upon, and the next day, the resident notified the Sheriff’s Office. 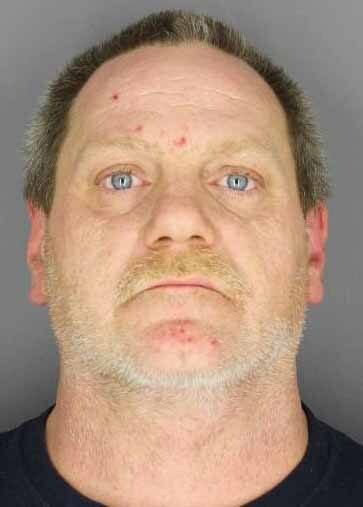 ONEONTA – An Oneonta man was arrested following an investigation into the ongoing sale of heroin in the city, according to police reports. 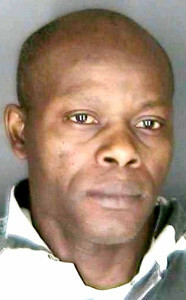 Chauncey S. Couse, 48, was arrested after Oneonta Police served a search warrant at his residency at 84 Spruce St. During a search, a quantity of heroin and cash were allegedly found by police, and Couse was charged with Class B Felony Criminal Possession of a Controlled Substance in the third degree. SOUTH NEW BERLIN – A 24-year-old Rhode Island man was killed at the Grand Slam Campground during Saturday evening’s violent storm when a tree limb fell onto his tent, county Sheriff Richard J. Devlin Jr. announced this afternoon. Ryan Sutcliffe, Cumberland, R.I., was pronounced dead after a tree limb approximately 4 feet in diameter broke off during the storm, landing on his tent while he was sleeping. SPRINGFIELD – Three Springfield residents were charged with possession of heroin and marijuana after a traffic stop on State Highway 80. 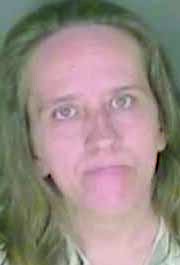 Just before 5 p.m yesterday, a county Sheriff’s investigator made a traffic stop on a vehicle being driven by Kimberly Clapper, 29, Springfield Center. During the investigation, four knotted baggies of heroin and drug paraphernalia were recovered. Clapper, as well as her two passengers, Michael Clapper, 38, and Austin Yaw, 21, both of Springfield Center, were all taken into custody. 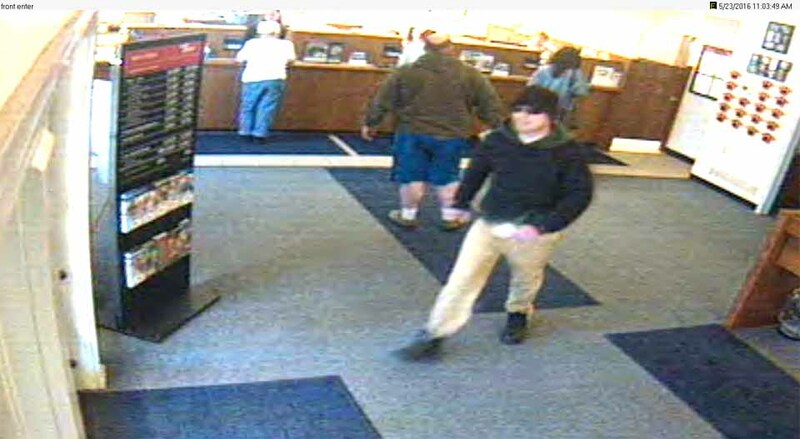 The suspect strides across the lobby of NBT’s Edmeston branch this morning in this video released by the Otsego County Sheriff’s Department. If you think you recognize him, call the sheriff’s department at (607) 547-4273. 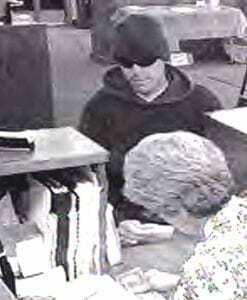 Here’s a closeup of the suspect at a teller station. EDMESTON – The Otsego County Sheriff’s Department a few minutes ago released surveillance photos from this morning’s robbery at NBT Bank’s branch here. The suspect is being described as mid-late 20s, between 5-foot-7 and 5-foot-10, with a tall, thin build. He was last seen wearing light colored pants, a dark colored hooded sweatshirt, dark colored shoes, a dark colored knit hat and dark rimmed glasses. The suspect allegedly entered the bank and demanded money from the teller, then fled with an undetermined amount of cash. MILFORD – A father from Milford was accused of shaking his toddler and then nearly hitting him with a car as he drove away. Troopers were made aware of a dispute at the home of Zachary Kaplan, 26, and during the investigation determined that he had grabbed and shaken the two year-old during a dispute. 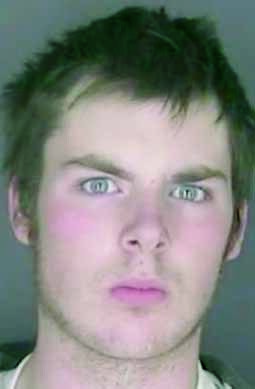 He fled the premises, nearly striking the child again, and was arrested by Otsego County Sheriff’s Deputies after he rolled his 2003 Jeep Grand Cherokee. He was uninjured in the crash. 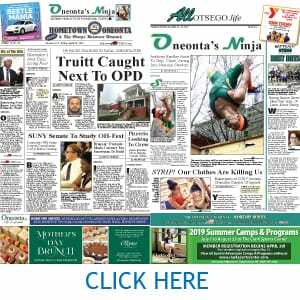 ONEONTA – An Oneonta father and son, as well as the father’s fiancee, were arrested yesterday after they allegedly sold morphine tablets to an undercover cop in the WalMart parking lot. 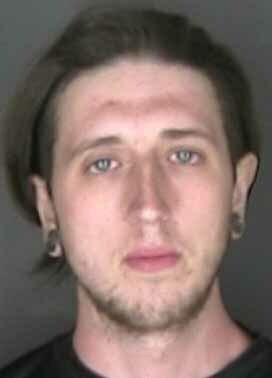 On Monday morning, an undercover Sheriff’s Office investigator allegedly paid Eric Wade Ferguson Jr. 20, of Oneonta, $540 for 15 100 mg morphine sulfate tablets during a drug buy in the Oneonta WalMart parking lot. 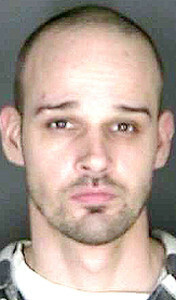 Ferguson Jr. was immediately arrested for criminal sale of a controlled substance in the third degree, a class B felony. ONEONTA – K-9 Ricky and his handler, Sheriff’s Investigator Keith Sheldon, brought down a suspected drug dealer trying to flee the scene of a raid at his home early Wednesday morning. 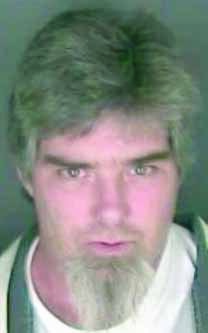 Harry Edmond, 45, of 34 Maple St., was arrested after members of the Otsego County Sheriff’s Office Special Enforcement Bureau, along with D.A. investigators, DEA special agents and patrol and detective bureau members from the Oneonta Police Department executed the no-knock narcotics search warrant at 8 a.m. Wednesday. Edmond tried to flee scene through a secondary door, but was detained by K-9 Ricky and Investigator Sheldon. Seized in the raid were nine and a half pounds of processed high grade marijuana, valued at $28,500, small quantity of crack cocaine, and electronic digital scale, an electronic stun gun and $16, 852. ONEONTA – A man who allegedly purchased marijuana from Jason Lee Foster in the Walmart parking lot in Southside Oneonta has been arrested, the county District Attorney’s office reported today. Dennis Curtis Mitchell, 31, of Sidney, is alleged to have taken an ounce of marijuana out of Foster’s unlocked truck and left $250 cash in its place on Thursday, Dec. 15. 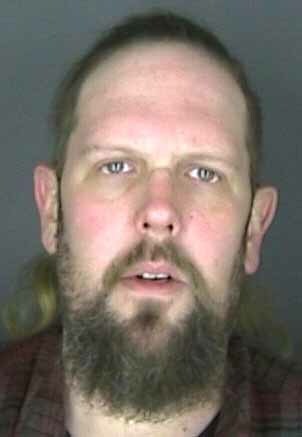 A warrant of arrest for conspiracy in the sixth degree, a misdemeanor, was obtained by the Town of Oneonta court for his arrest on Dec. 24, and yesterday, with assistance from the Village of Sidney police department, Mitchell was arrested. He was arraigned by Oneonta Town Judge Bruce A. Smith and remanded to the county Correctional Facility on $500 bail, returnable Jan. 21 in Town of Oneonta Court. Chief Assistant District Attorney Michael F. Getman is prosecuting the case. ONEONTA – Three Mount Vision residents were arrested this afternoon on a variety of charges after investigators observed “suspicious activity” in the WalMart parking lot on Southside Drive, Oneonta. On Thursday, Dec. 15, investigators observed a suspected drug deal in the Walmart parking lot and observed, in plain view, two pills in a plastic baggie inside the vehicle. They traced the vehicle’s owner, Jason Lee Foster, 33, and determined that earlier that morning, he left an ounce of marijuana that he was going to sell in his unlocked pickup truck in the parking lot. Another individual later went into Foster’s truck, retrieved the marijuana and left $250 in cash.